in which we use actions to find sizes of groups, subgroups and stabilisers, and prove Cauchy’s Theorem. Having learnt about several standard actions including various flavours of conjugation last time, we started today with some applications of actions in general and the Orbit-Stabiliser Theorem in particular. By letting the rotations of a cube act on the set of vertices, we found that the group of rotations has size : vertices, each with an (easy to find) stabiliser of size . Having found the size of the group of rotations, we can then use Orbit-Stabiliser to help us find stabilisers of more complicated actions: letting the rotations of the cube act on the three “pairs of opposite faces” , we saw that the stabiliser of must contain elements. In a previous lecture we found of these easily, so now we know that we need to look harder to find two more. The Taylor-cube can help to visualise this very well. After that we saw how the left coset action can help us find out things about possible subgroups of a group . If of index , through the left coset action we get a group homomorphism . The kernel of this group hom is a normal subgroup of . This can now be used in different ways for different situations. If , then we know the kernel is not all of , so either we find a normal subgroup (which could be ), or if we know that is simple, then the kernel must be . Then we have an injection , which gives us a restriction on through the size of : . Using the signature homomorphism as well lets us refine this to for simple groups. Our main theorem today was Cauchy’s Theorem: every finite group with prime dividing contains an element of order We saw earlier in the course that this is not the case for non-primes! There are several different proofs of this theorem. Here are the main ideas of our proof: we start with the idea that an element of order satisfies , where we multiplied the element with itself times. So this prompted us to look at -tuples which multiply to the identity. A tuple of the form is special: it does not change if we “rotate it round”. So we acted with a cyclic group of order on this set of -tuples of which multiply to the identity. By looking at the size of orbits, which partition the set we are acting on, we found that we must have some orbits of size (in addition to the one containing ). And such a singleton orbit gives us an element of order . One of the main things I would like you to take away from the rotations of the cube example is that to find a certain set/group, such as a stabiliser, it is much easier if we know how big it is to begin with! This tells us whether, after having written down all the obvious ones, we can stop or have to keep on looking. It also makes proofs of “this is exactly the stabiliser and nothing else is in it” a lot easier. The argument using left coset action is a very useful one! So when you get to do example sheet questions, remember it :-). The proof of Cauchy’s Theorem can look a bit daunting at first. But perhaps my summary above will help to make it a little clearer. You can also write your own summary of it. There are different proofs, so if you really don’t like this one, see if you can find another one in a book. I chose this one because it just uses one action rather than lots of “magic” combinations of different actions pulled from thin air. Next time we will look a lot more at actions on polyhedra, including the rotations of the cube and all symmetries of the cube, as well as tetrahedron symmetries. 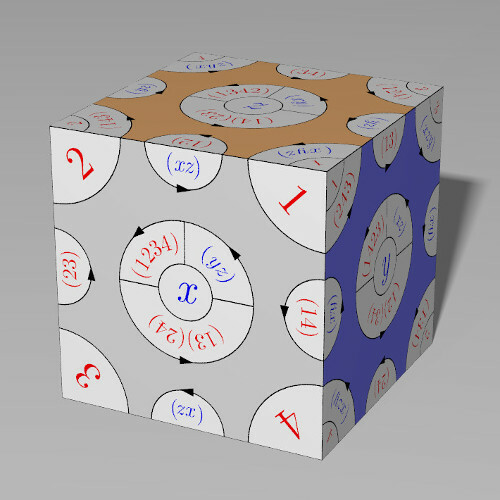 So if you haven’t made your own “Taylor cube” yet, now would be a good time, and you could even bring it to the next lecture (it makes it so much clearer!). We will also start looking at symmetric groups again, studying the conjugacy classes in those particular groups. So brush up on your disjoint cycle notation. The left coset action argument is a nice example of how to use theory rather than do everything by hand from first principles. As a category theorist, I much prefer using general results and structure to messing around with details :-). Though both methods have their place. If you want to get a deeper understanding, you should train yourself to look for connections between different results and situations though. In this argument we used the Alternative Action Definition, we used that every kernel is normal, we later used the signature homomorphism as well. Putting together these results from different chapters/subareas gives us more insight into the situation we are faced with. In fact, this argument itself can be used on different kinds of actions: in second year Groups, Rings and Modules, you will find that it is also useful when used on the conjugation action on subgroups, or on a particular subset of the subgroups, called Sylow -subgroups. We can adapt this argument to different kinds of actions because the main part of the argument just uses the homomorphism from to where is the set we are acting on, so if we know how big that is, we can form a similar argument. If you look back through your lecture notes, you might (or should) find one or two places where I would have loved to use Cauchy’s Theorem but couldn’t because we hadn’t proved it yet. So we had to find another explanation. Can you find at least one such a place? Also, if you look back at “exponent divides group order”, we can now see that in fact the exponent has every prime as a factor that is a prime factor of . Can you prove it?